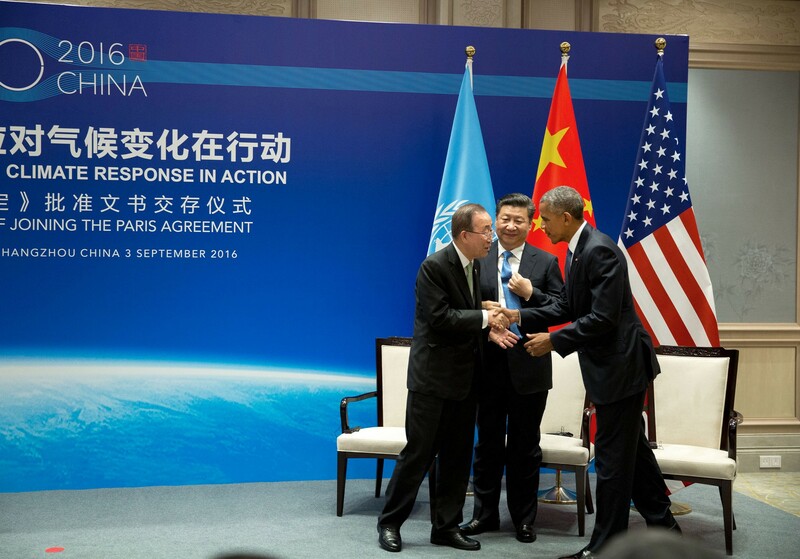 Today, the U.S. joined China in taking a major step forward in the global effort to combat climate change. Today, the United States and China deposited with United Nations Secretary-General Ban Ki-moon their respective instruments to join the Paris Agreement, marking a significant contribution towards the early entry into force of the Paris Agreement. 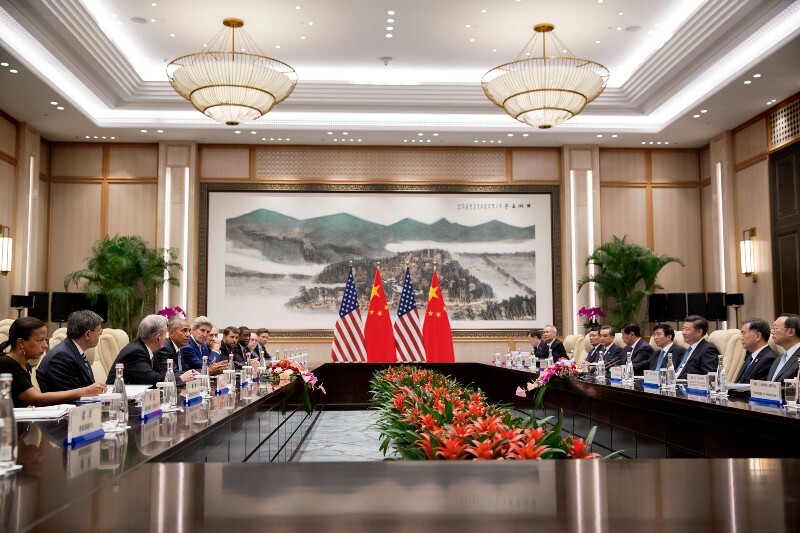 Today’s action by the United States and China to formally join is a significant step towards entry into force this year with countries representing around 40 percent of global emissions having now joined and more than 55 countries having already joined or publicly committed to work towards joining the agreement this year. One of the reasons I ran for this office was to make sure that America does its part to protect this planet for future generations. Over the past seven and a half years, we’ve transformed the United States into a global leader in the fight against climate change. But this is not a fight that any one country, no matter how powerful, can take alone. That’s why last December’s Paris Agreement was so important. Nearly 200 nations came together as — a strong, enduring framework to set the world on a course to a low-carbon future. And someday we may see this as the moment that we finally decided to save our planet. There are no shortage of cynics who thought the agreement would not happen. But they missed two big things: The investments that we made to allow for incredible innovation in clean energy, and the strong, principled diplomacy over the course of years that we were able to see pay off in the Paris Agreement. The United States and China were central to that effort. Over the past few years, our joint leadership on climate has been one of the most significant drivers of global action. In 2014, President Xi and I stood together in Beijing to announce landmark climate targets for our two countries to meet. That announcement set us on the road to Paris by jumpstarting an intense diplomatic effort to put other countries on the same course. In 2015, we stood together in Washington to lay out additional actions our two countries would take, along with a roadmap for ultimately reaching a strong agreement in Paris. This year, in 2016, we meet again to commit formally to joining the agreement ahead of schedule, creating the prospect that the agreement might enter into force ahead of schedule, as well. The United States and China are taking that step today, as our two nations formally join the Paris Agreement. Of course, we could not have done this extraordinary work without the strong support of the Secretary General of the United Nations, Mr. Ban Ki-moon, who has been an outstanding leader on this issue, as well. Now, just as I believe the Paris Agreement will ultimately prove to be a turning point for our planet, I believe that history will judge today’s efforts as pivotal. For the agreement to enter into force, as has already been stated, 55 countries representing 55 percent of global emissions must formally join. Together, the U.S. and China represent about 40 percent of global emissions. So today, we are moving the world significantly closer to the goal that we have set. We have a saying in America — that you need to put your money where your mouth is. And when it comes to combatting climate change, that’s what we’re doing, both the United States and China. We’re leading by example. As the world’s two largest economies and two largest emitters, our entrance into this agreement continues the momentum of Paris, and should give the rest of the world confidence –- whether developed or developing countries -– that a low-carbon future is where the world is heading. Of course, the Paris Agreement alone won’t solve the climate crisis. But it does establish an enduring framework that enables countries to ratchet down their carbon emissions over time, and to set more ambitious targets as technology advances. That means full implementation of this agreement will help delay or avoid some of the worst consequences of climate change, and pave the way for more progress in the coming years. This is the single-best chance that we have to deal with a problem that could end up transforming this planet in a way that makes it very difficult for us to deal with all the other challenges that we may face. President Xi and I intend to continue working together in the months ahead to make sure our countries lead on climate. Three years ago, in California, we first resolved to work together to secure a global agreement to phase down the use of super pollutants known as HFCs, and we’re now just six weeks away from final negotiations. We also have the chance to reach a global agreement to curb emissions from the global airline industry -– one that actually has the support of industry. And today, we’re putting forward roadmaps to get both negotiations done this year. On each of these issues, the United States and China have now developed a significant record of leadership on one of the most important issues of our time. Our teams have worked together and developed a strong relationship that should serve us very well. And despite our differences on other issues, we hope that our willingness to work together on this issue will inspire greater ambition and greater action around the world. Yes, diplomacy can be difficult, and progress on the world stage can be slow. But together, we’re proving that it is possible. And I was reflecting before we came in here with Secretary General Ban Ki-moon about the meeting that we had in Copenhagen in my first year of my presidency, which was quite chaotic. And I think it is fair to say that if you had looked at the outcome of that meeting, the prospects of us being here today, the prospects of a Paris Agreement seemed very far away. And yet, here we are, which indicates that where there’s a will and there’s a vision, and where countries like China and the United States are prepared to show leadership and to lead by example, it is possible for us to create a world that is more secure, more prosperous, and more free than the one that was left for us. So to all of you that have participated in this extraordinary effort, thank you very much. Thank you to President Xi. Thank you to the Secretary General.